Hi friends, How are you all??? Hope you all enjoyed this diwali very well with sweets, crackers, relatives and friends especially with god blessings!!! one more thing that it needs very less amount of ghee and quick time to prepare... interesting na!!! Take a microwave proof bowl add corn flour, sugar, water and food color mix well without any lumps. Microwave High for 6 minutes, after 3 minutes stir in-between. Now again keep 6 minutes, stir every 2 minutes. When remaining 2 minutes add cucumber seeds and 2 Tsp of ghee mix well and keep it for 2 minutes. Now take out from oven and mix well. Now pour this into a greased plate and cool it to cut into pieces. YUMMY CORN HALWA IS READY FOR U!!! Don't reduce the amount of sugar, otherwise halwa is not come to correct consistency. Make sure the entire process will be in High power of MW oven. Add cardamom powder to the batter. You can add ghee fried cashew, badam instead of cucumber seeds. nice preparation viji.. like the green color..
Anyways, nice and easy halwa.. Green color makes it interesting..
so lovely and tempting sister.coming soon to Dindugul.just 1 1/2 hrs travel.coming soon sister. Very Very interesting, I like the colour!.. i have made this in a very similar way and it tasted so yummy!!! 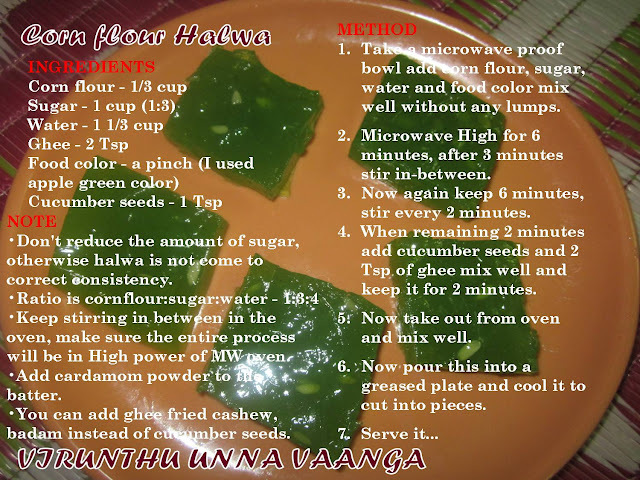 green halwa - looks so good!! Belated diwali wishes to you and your family.Very attractive colour,thats a great looking halwa. It's really a lovely colour! Halwa looks great and delicious! Yum! Looks so attractive and shiny..
Lovely color and looks yummy yummy. Wow. Same pinch no touch dear!!! I too used green color for corn halwa in microwave!!! !